What is TAKE OUT THE TRASH? What does it mean? TAKE OUT THE TRASH can be used in many ways. However, it was started as an initiative to bring credit and appreciation to our blue collar workers in our local communities. When do we scream TAKE OUT THE TRASH? 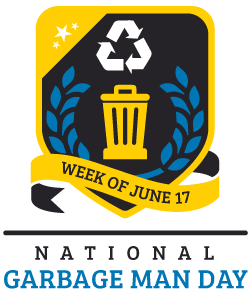 The following waste companies are joining us in celebrating the hard working American's who "take out the trash" everyday. We're also supporting our local teams across a range of sports. Pit Stop Sanitation Services Inc.
A C & T Co. Inc. Waste Haul of TN, Inc.
C & R Pumpers Inc.
Wrestling "Stone Cold Steve Austin"
Johnny On The Spot Inc.
Elitte Septic Tank & Grease Trap Service Inc.
A-1 Clean Up & Movers Inc.
Hy & Carl's Waste Inc.
Lake Area Disposal Service Inc.
David Jordan & Company Inc.
TAKE OUT THE TRASH is an initiative meant to be spread with pride and valor across the many aspects of the Sanitation Industry. Truck Drivers, School Teachers, Grocery Store Workers, Single Mothers, Fast Food employees and movie theater staff are just a few of the many examples of hard working Americans and if you think about it, we all, "Take Out The Trash." Though in different ways, we all share a similar task and that is to keep our surrounding areas clean. With today's uncertain economic stability, many of us would like to support our favorite teams but can not afford expensive seats at our local sporting events. One day John Arwood and Michael Nancarrow (the Director of Communications for the Arwood Waste headquarters based out of Jacksonville Florida) were discussing this at length and came to the conclusion that it's just not right that some of the biggest sports fans they knew were also some of the hardest working people they knew and that they could not always afford to go show support for their local teams. This is why starting this 2016 Season they came together and bought season tickets for their employees to reward hard work and dedication. As most things at AW though this was embraced with a bigger vision than just themselves. They wondered how could they spread this to benefit sanitation workers across the U.S. They thought a fun way to bring attention to this issue would be to send their most charismatic, hardest working (and sports loving) employees to the games to bring awareness. Not only do we help keep America Clean but we also know how to keep you entertained! Be on the lookout this year for your local Sanitation workers at the games! In the case of Arwood Waste, the owner (John Arwood) purchased some "nosebleed" seats for his employees to reward the hard work of those who may not necessarily be able to afford expensive tickets. While these may not be the most desirable seats there will be plenty of seats in this area to grow! This allows us to rally up other waste companies in our area and have the ability to sit together. For some this will be the first game they have ever attended! We suggest you meet with the leadership of your company to pitch the idea to them. It's a win-win for everyone involved. Now let’s go TAKE OUT THE TRASH together! Join the Team Take Out the Trash mailing list.